A few years ago we took our girls to see Peter Pan in the Cleveland theatre district. Mary Martin popularized the stage rendition in the 50’s to wide acclaim. The depth of the show with the orchestra, the lighting, Peter Pan flying with harnesses made for quite a good show even sixty years later. A good play pulls together the actors, the behind-the-scenes stage hands into a seamless orchestration of the drama. The stage and the backstage work together to make it happen. You would never do a play without a good backstage. There would be little magic on stage. You wouldn’t do a play with out a frontstage. It would just be a mob in a room. Everyone must do their part. I want to use this metaphor to explain how discipleship happens in the church. One of the beautiful things about discipleship is that happens in so many contexts throughout the church. <– The Pulpit is where for most people they get engaged with discipleship. The worship service is where everyone participates. Here the preaching pastor has the opportunity to help the transformation. Learning & teaching happen here. 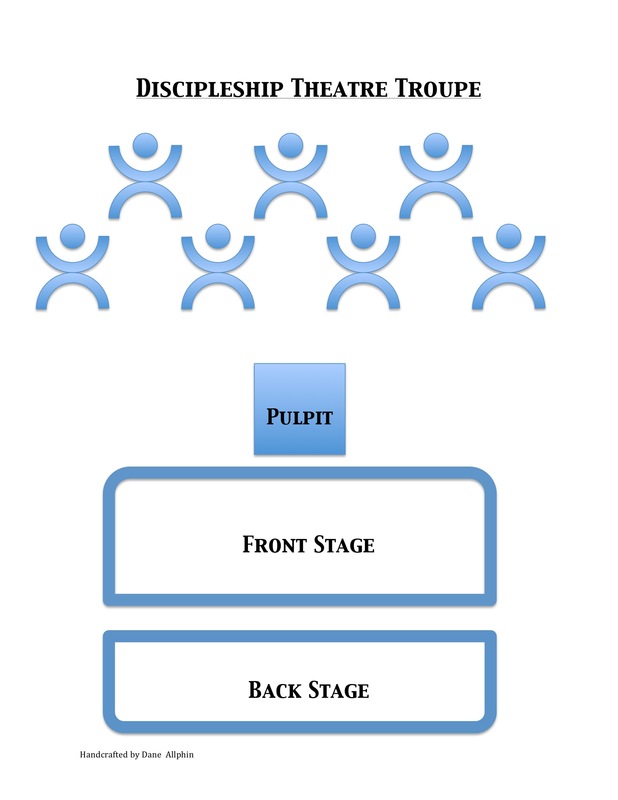 <– The frontstage is the visible component in discipleship, where learning & application occur. We call them a lot of things: Small Groups, ABFs, Womens/Mens Ministry, Sunday School. <– The backstage is less visible. It is organic in its process. It happens all over the church and in every little interaction. In the backstage people are moved along spiritually as they walk through life. They learn from example and other’s lives. They find mentors whether casual or deliberate who assist them. They gather with a few to be challenged in their faith. These experiences are not catalogued by the church. They happen naturally and build great strength. So what’s forgotten? Generally what most churches spend their energy on is the Frontstage. Nothing wrong with that. I spent nine years working and tweaking what happens on that stage. It is a critical piece. But it is not the only piece. Just like we’d never run a play without a backstage we must remember not to forget the power of a strong backstage. Here’s a few reason’s to build a strong backstage. First, think about who gets a piece of the action. In preaching it is only a few who get to preach. There is a reason why we ask some not to preach. zzz :^) In leading in groups some get to lead and teach. But in the backstage everyone can disciple someone else. Second, think of the power in a church when people begin to believe they can impact others. There becomes a web of strength that is unbreakable. Instead five or ten folks considering how they help in disciple-making, you could have 200 thinking about it! That’s strength throughout the church for everyone. The key then becomes building a strong backstage of discipleship. What helps encourage more folks to take the initiate? What are the skills that these kinds of disciplers need to know? More on these questions later.